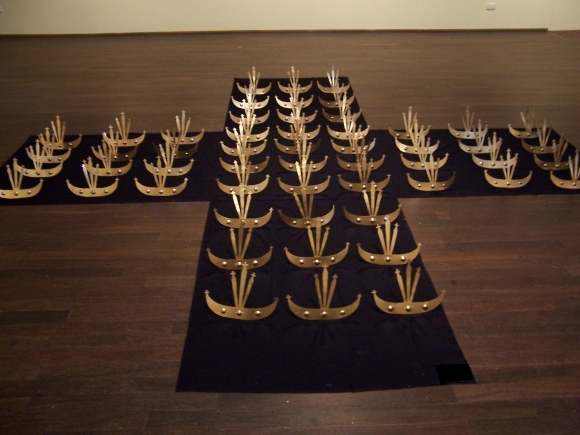 Maria Madeira, who was born in Timor-Leste in 1969, can be considered to be one of the founders of what came to be termed as the ‘Movimentu Kultura’ – a group of contemporary artistic practices that engages ‘fragments of traditions’ and involves the entire artistic community of Timor-Leste. Madeira’s artistic activity has always been inspired and sustained by the culture of Timor-Leste. Initially a voice of resistance in exile, Madeira’s contemporary approach is aimed at her fellow citizens, especially Timorese women. 1This is an excerpt of a conversation I had in 2013, during my second research trip to the country of Timor-Leste, 2 with César, a local artist and leader and founder of the sanggar Dejukddil, one of Timor-Leste’s many artist collectives.3 Responding to my questions, he described current trends in the country’s visual arts. Following this conversation, I asked other artists from the community, such as Maria Madeira and Tony Amaral, and organisation leaders like Iliwatu Danabere and Ino Parada, about this term “Movimentu Kultura.”4 Everyone approved of his use of this expression. As a result, I began to employ his designation to theorise contemporary artistic practices in Timor-Leste. 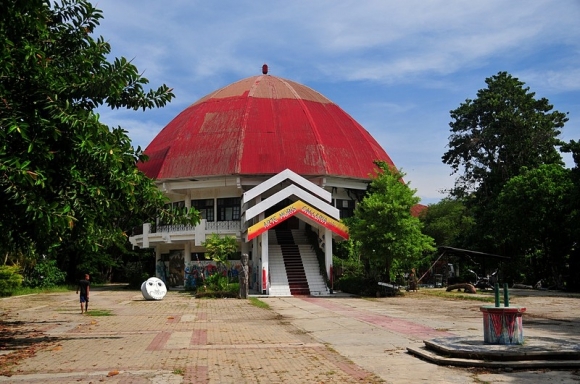 2In these field trips to the country I witnessed a general revival of traditional Timor-Leste culture.5 Interestingly, contemporary art practices are also flourishing. Historian Eric Hobsbawm has found that periods of great change – especially political change like Timor-Leste’s independence process – are followed by periods of transition rich in artistic manifestations, which are often imbued with a national and traditional patina. In Timor-Leste, the combination of these tendencies is known as the Movimentu Kultura, and I maintain that Maria Madeira is one of its founding members. 6 During the years of occupation (1975-1999) Timor-Leste was considered Indonesia’s 27th province. 4Simultaneously, and outside the country’s borders, Maria Madeira emerged in Australia, as the first contemporary Timorese artist. Maria had fled the country with her family in 1976, and would only return after independence in 2000. Being an exiled citizen contributed to her constant references to the country from which she had been uprooted. 5The disposition to speak about collective values has grown into a discourse, and continued after the country achieved independence in 2000. Born from a period of extreme anguish, when the Timorese didn’t know if they would succeed, the persistence of the Movimentu Kultura is also related to continuous changes – political, social, etc. – that the country has undergone since 2000. 6Movimentu Kultura is an artistic movement that seems to span all the main tendencies and media of contemporary art – ritual and religious manifestations are not considered in this analysis. By nature, these are profane manifestations, which are imbued with some aspects of traditional values, and often associated with ritualising trends. For the Timorese, worshiping the ancestral culture is an ongoing practice that is materialised in ceremonial events. 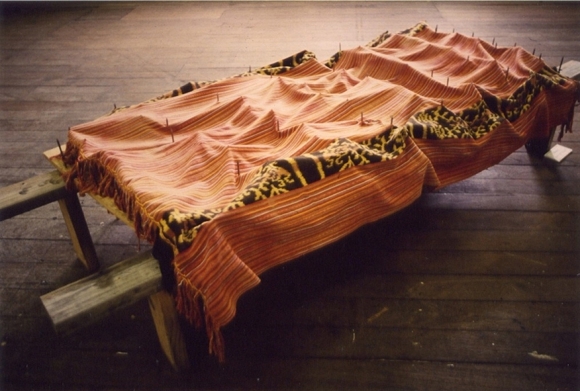 The artists of Movimentu Kultura often document and/or utilise references in their works such as traditional symbols, imagery, objects and cultural events as sources of inspiration for their artwork as a shared practice. Image 1. Arte Moris Installations, Dili. 7The material expression of Movimentu Kultura encompasses all available media including installation and performance, but painting on canvas appears to be the preferred form of expression of contemporary artists. The most distinguishable material aspect of Movimentu Kultura relates to the incorporation of ‘fragments of tradition’, that are understood as legacies from the cultural past. Such fragments are utilised in three main forms, varying from what can be described as a surrealistic tendency (born from contact with books and images) to a naturalistic one (encompassing portraits, landscapes and aspects of everyday life). The third disposition, which can be described as assemblage and collage art in a synthetic cubist fashion, results from the placement of certain traces (pieces of traditional cloth, betel nut paste, shells) onto the space of the canvas. These three main trends, more preeminent in painting, share space with the growing trends in installation art, performance art, block printing and ready-made art. 8This movement continues the “phenomenon of critical expression” (Barrkman: 2008) that first emerged in Timor-Leste in the 1980s. In those days, it constituted a form of protest against the Indonesian occupation, which continued until self-determination was granted in 1999. Its roots are to be found in wall art that was practiced then and continues to this day. During the occupation years (1975-1999), walls (inside the Comarca Balide Prison, street facades of the major cities and of some private homes)7 have been canvases for the expression of feelings where ideas of freedom were communicated. All visual art was related to the political agenda – propaganda posters and banners, painted canvases and images of resistance began to flourish in this period. Image 2. Arte Moris Collaborative work, 2009. Recycled tobacco boxes. 10In the 1950s, Cinatti’s students publicly exhibited their works. Their art was romantic in style and descriptive in content: in line with the first modern tendencies, the Timorese began depicting everyday scenes. Of this group of artists – the most renowned are José Martins Branco, Daniel Peloi, Sequito Calsona and João Soriano – all resorted to surrealistic painting, during the Indonesian occupation. Surrealism provided an escape from hardship. Interestingly, in the Indonesian town of Yogyakarta, the same circumstance took place during the New Order regime: artists like Entang Wiharso were practicing narrative paintings that expressed their desire for freedom, but in a hidden manner difficult to trace, that can be attributed to the surrealistic aspect of compositions. This group of artists would be recognised by the regime as the ‘senior artists from Timor-Leste’, Indonesia’s 27th province, and a territory for new possibilities. Image 3. “Renascence”, 2007. 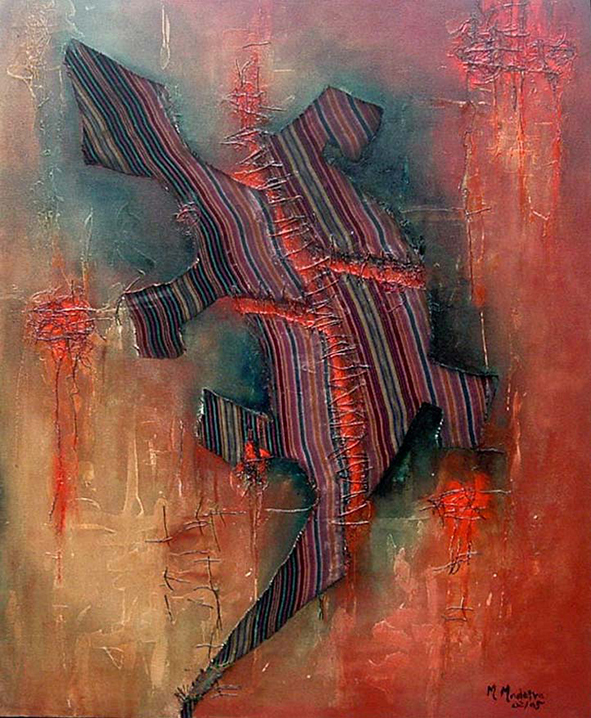 Mixed media on canvas with betel nut, 61 x 76 cm. 11This trend towards escapism was broken by younger generations, when in 1996 Yahya Lambert, an Indonesian artist living in East Timor, displayed in the Becora Culture Centre in Dili the first painting on tais ever shown.9 The shortage of canvas led to this development, and the regime considered this occurrence an “alternative and distinctly East Timorese art medium”. (Barrkman, 2008) A tradition had been invented and the so-called New Order regime, which was concerned with maintaining the country’s motto Unity in Diversity, used these classifications to integrate the Timorese peoples’ into the Indonesian realm. 12Also in 1996, Maria Madeira exhibited for the first time in Perth’s Institute of Contemporary Arts (PICA). The exhibition gained the attention of media that had become aware of human rights violations in the Timor-Leste since the global mediation of the Santa Cruz massacre of November 12th 1991. 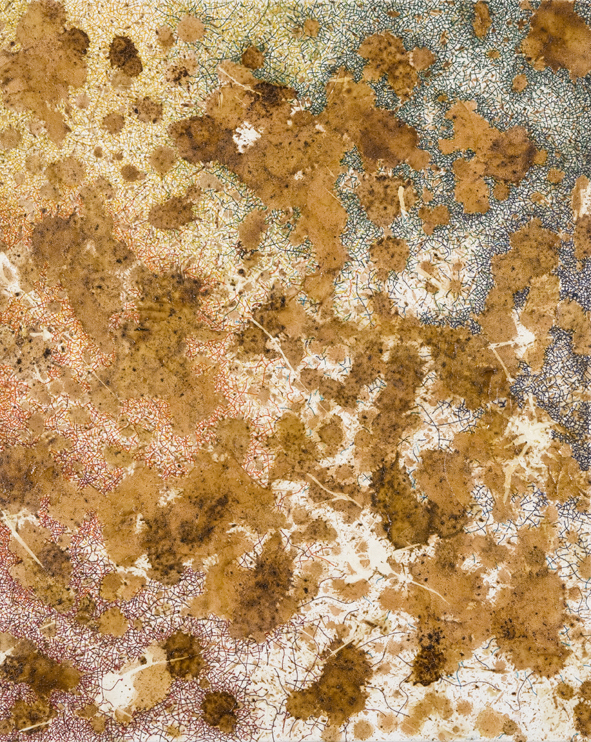 In those early days (and this remains ongoing), Maria Madeira’s works also incorporated fragments of tais on her canvases. 13As observed, the Movimentu Kultura appeared in two streams, within the country’s borders and abroad, and both streams incorporated elements from the country’s culture that are perceived as exclusively Timorese such as tais (the national cloth). More recently, and especially after independence, Movimentu Kultura has aggregated all current practitioners, from senior artists, who have a solo practice, to younger ones, who live in artists’ communities.10 The communal aspect of art remains very important in Timor-Leste; the opening of sanggars (or artists’ communities) since the 1990s has contributed to the emergence of the Movimentu Kultura. 13 http://artemoris.org/about/, accessed March 11th 2014. 15Johanna Barrkman points out that after 2002 (from 1999-2002 the country was under the control of the United Nations), Timor-Leste’s contemporary art began to proliferate: new artist communities were created, driven by the therapeutic aspects of art and social gathering. (Barrkman, 2008).12 At the beginning of 2003, with the support of Nobel Peace Prize recipient José Ramos-Horta, the first Academy of Arts, Arte Moris, was created.13 The school is housed in the former site of the Provincial Museum of East Timor of the Indonesian Republic (Image 1). 14 Charline Bodin, interview with the author, Evecom TL, Dili, 09/04/2013. 16Arte Moris, an initiative of the Swiss couple Luca Gansser and his wife Gabriela Gansser would change the situation; to this day Arte Moris is the hub of contemporary art in the country, and it houses the only existing collection of contemporary art. The couple has trained, albeit in a ‘free-style’, several of the currently practising artists. Charline Bodin, a former volunteer at this institution, says: “Arte Moris students possess a kind of mental freedom. Luca and Gabi did a lot for art here, but unfortunately they didn’t train the students to continue teaching art after they left”.14 Bodin explains that the first generation of students, which totalled around fifteen artists, was highly stimulated by the Swiss couple, resulting in good artistic practices. The couple mounted several exhibitions in Timor-Leste, Australia and Switzerland, took some local artists overseas and introduced the local students to the discourse of Western art in several lectures. Image 4. “Hidden Treasures II”, 2005. Mixed media on canvas, 61 x 91 cm. 17The Arte Moris Museum, also founded by the Swiss couple, has several works by individual artists, in media that range from painting to installation. 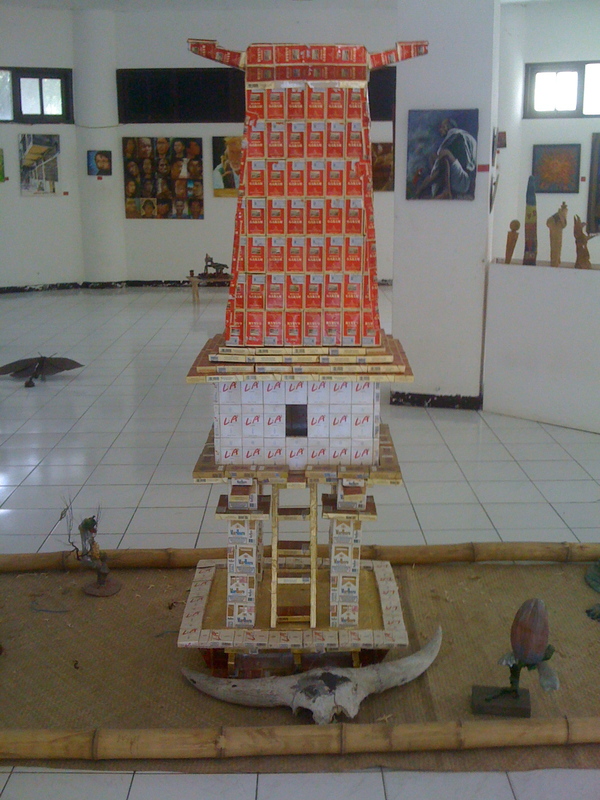 Collaboration art is also part of the school’s legacy: the most impressive installation present in the gallery is a collaborative work made from re-used tobacco boxes (Image 2), representing ‘an uma lulik, the sacred house of Timor-Leste’.15 This installation follows the architecture of the uma lulik from the region of Lospalos, in the eastern side of the country: the house stands above ground level, and has a very tall and inclined roof. Around it are displayed found objects such as buffalo horns – which are sacred symbols for the Timorese. 18In addition to developing a sustained practice, the art school students grasped the attention of the foreign community that lived in the country during the peacekeeping period of 2002-2012. This international community provided Arte Moris students with a new and emerging market. These foreigners were open to the new and the old, a combination that the artists could promptly offer. 19Other practising artists continued in the same period to practice and populate the art scene with their individual styles. Among these senior artists, the most renowned are Gabriela Carrascalão, João Bosco, Gelly Neves, and Sebastian Silva (who is no longer active). 16 Belak is a metal crest-shaped ornament worn on the chest by a man. 17 Ino Parada, interview with the author, Gembel Art Collective, Dili, 07/04/2013. 20The maintenance and continuation of Movimentu Kultura is thus strongly related to the permanence of the U.N.’s peacekeeping force, to the presence of the Swiss couple (and the creation of Arte Moris) and simultaneously to the emergence of a market for traditional and authentic East-Timorese art. The artists were prompt to adjust their art to the market needs, and thus the Movimentu Kultura knows no orthodoxy: for instance, upon one of my visits to the Gembel Art Collective, Ino Parada was painting a portrait of a woman wearing a belak, a masculine symbol.16 Responding to this observation the artist replied, “that is what she asked for”.17 This flexibility is intricately related to the use of cultural aspects as mere symbols, in response to market needs. It also reveals a subversive attitude towards the rigidity of traditional values. The fact that tourists are ignorant of the values these symbols hold, combined with the artists’ flexibility towards these values, has permitted artists a freedom impossible to obtain if the market had been constituted solely by connoisseurs. 18 Iliwatu Danabere, interview with the author, Arte Moris Free Art School, Dili, 09/04/2013. 22The movement has always been related to notions of a collective identity residing in the memory of artists; of specific aspects related to the various ethnicities that constitute Timor-Leste (artists commonly refer to their origins – Lospalos in the case of many like Tony Amaral, or Ermera, in the case of Maria Madeira). More recently, ideas of documentation, reconciliation and nation building gained wider importance: artists have explained to me that the use of ‘fragments’ and notations of their local traditional culture relates to their attempt to recuperate and consolidate those customs, while making them known to the entire country and foreign communities. 23What unites practitioners, whether working individually or collectively, is thus a concern for ‘what it means to be East-Timorese’. In search for this identity, artists say: “we look at these symbols – [kaibauk (a crown), morteen (a women’s necklace made of coral beads), belak (a silver necklace piece for men), lafaek (the crocodile), uma lulik (sacred house)] – because in them lies the true Timorese identity, which is prior to Portuguese times”.19 Despite the essentialism of this affirmation, the Timorese believe that it is important to look to the past to affirm their sense of identity. Image 5. “Silence at what Price?”, 1996. Mixed media with tais, 2 x 1 m.
24Some painters influenced by surrealism (which is also imbedded in fragments of cultural traditions), can be included in a distinct stream of the Movimentu Kultura. The works of senior artist Gabriela Carrascalão (Dili, 1949 - ),20 the younger Alfeo (Lospalos, 1984 - ),21 and Abe (Ossu, 1984 - ),22 communicate with a different voice, by turning to more colourful schemes in dream-like compositions: their voice is internal, and has little relation to political events, but rather works the soul. The dual relation between humans and the country is the most explored theme and is often depicted in populated landscapes, of people dressed in tais. This might suggest the artists’ longing for a peaceful and harmonious setting, while indicating a tribute to the resilience of the Timorese. 25The most widespread tendency within Movimentu Kultura is associated to the Arte Moris group of artists (in which Maria Madeira can be included) and is characterised by social and political commentary. In its formal aspects, it is recognisable by a constant incorporation of elements of traditional dance costumes, especially the tais, a colourful dye-resisted woven cloth, and the kaibauk and morteen the crown and necklace worn by women and men. The assemblage of these fragments (textiles and other found materials) appears in works made in various media. 26Thematically, we can trace a tendency towards storytelling and narration. The most depicted story from the country’s oral tradition is the legend of the Lafaek, a symbol of the country’s physical emergence.23 The concept of lulik, which in the past served as a disciplinary life force,24 appears in depictions of several uma lulik, the sacred house in which the Timorese believe their ancestors reside. 25 In addition, historical narrative and portrait genres are commonly used to report episodes of the country’s history. These works, which always contain adornments perceived as traditional, range from the depiction of tourists to elderly figures, oppressed people and images of public figures (like Ramos-Horta or Xanana Gusmão). 27The artists of this branch of the Movimentu Kultura (the Arte Moris social commentary line) show an inclination towards reporting on aspects of daily life. Their work is often imbued with messages conveyed to disparate audiences, local and international, through tradition. History is also conveyed: the Santa Cruz massacre of 1991, the 1999 crisis and the 2006 conflicts are frequently remembered in the work of these artists. 28It seems that we have a case of an ‘invented tradition’, to refer to Hobsbawm’s theory: traditional culture, which remained alive, was re-integrated in the spirit of the new nation. As Hobsbawm explained, the emergence of a nation state constitutes a moment prone to this, and Timor-Leste is no exception. We are before a usage of local traditions, in continuation with the time of the Indonesian occupation, but the manner they have been utilised, without orthodoxy, even adapting their traditions to the requests of the buyers, constitutes a response to an emerging market force. A discourse that was begun by the Timorese, it shows attentiveness to changing circumstances, while displaying a continuity of narrations: the artistic community has been appropriating the various cultures at their disposition and utilises them symbolically. Thus, in the case of Timor-Leste, ‘invented traditions’ can be seen as catalysts for expression, while they contribute to the nation-building process and to the writing of its history. 26 The artist in conversation with the author, Dili, 10/07/2011. 30Her actions are directly related to the fight her fellow compatriots were engaged with inside the country. Since the 1990s, when Maria Madeira began her work as an artist, she has continued to feel driven to express her Timorese identity (perhaps inspired by a longing for her homeland) while conveying the situation that her compatriots were facing. To their voice, she added the numerous voices she gained in exile: subject to constant changes of location, her identity suffered mutations that are now expressed through the employment of three languages in her work – Tetum, Portuguese and English. She achieved international attention and recognition especially after the 1991 Santa Cruz massacre that was broadcast to the entire world. Just three weeks after the events, Maria had a show at Curtin University, in Perth, Australia. 27 The artist in conversation with Filipa Queiroz, Macau, 10/06/2011. 34A good example of her educational work is an activity Madeira organised while teaching at Arte Moris in 2009.31 The students painted in a ‘Pollockian’ fashion, by spitting betel nut juice on blank canvases, something Maria has been doing herself since 2000. 32 In her country, the betel nut is chewed as a symbol of greeting between families, by men and women. 35When Madeira returned from exile, she learned about more aspects of the culture that she later employed in her compositions. One example was betel nut chewing; after her family invited her to chew the nut. As a result of learning this custom, Madeira began utilising it in her work as a distinctive East-Timorese practice – one that involves drinking a bit of alcohol, and thus promotes relaxation and laughter (Image 3). 36In taking this activity to the art school, she tried to engage the students to work with each other to awaken their sense of collectivity. Image 6. “Troubled Spots”, 2006. Mixed media on canvas with tais, 61 x 91 cm. 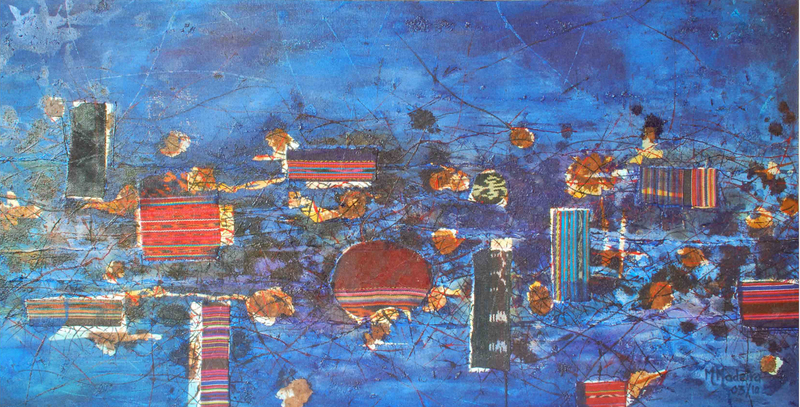 37Maria Madeira’s abstract compositions contrast with the other members of the artistic community: even though she utilises symbology pertaining to Timorese historical events and traditional customs, she does not illustrate them through realistic compositions, but through an interplay where composition and wording are equally important. Another distinguishable feature of Madeira’s work is that she does not paint on tais: she perceives tais as art, and thus she respects its integrity. The fact that she started by only collating fragments of this cloth became an effective part of her discourse: to this day Maria does not paint on tais. She either applies threads or small pieces onto the canvas, depicts her compositions as ‘covered’ by tais (Image 4) or uses them as ready-made objects to convey certain messages, like the death of Fernando Boavida during the Indonesian occupation. The installation Silence at What Price? (1996) displays a tais cloth laying on a bed of nails, alluding to the way he was tortured (Image 5). What is different in Madeira’s approach to tais is that due to her perception of the tais fabric as sacred – something that is brought from the ancestral culture she tries to convey – she feels obliged to maintain its materiality. Her circumstance as both an insider and outsider of her own culture (resulting from her long period in exile), and her emergence as a diasporic artist may have contributed to the maintenance of her reading: her sacralisation contrasts with the way in which other artists’ utilise the traditional culture in a secular way. Image 7. “First Aid”, 2005. Mixed media on canvas with tais, 65 x 80 cm. 33 Maria Madeira, interview with the author, Dili, 03/07/2011. 34 The artist Maria Madeira often describes her own artwork, and provided me with a complete list. 35 Ron Banks, “Protest in Paint”, in The West Australian, June 25 1996. Image 8. “270 + The Santa Cruz Massacre”, 1996. Mixed media, 3.5 x 3.5 m.
36 Maria Madeira, List of Works 2003-2011. Dili, unpublished, 2011. 37 Maria Madeira, List of Works 2003-2011. Dili, unpublished, 2011. Image 9. “Hili Batar, Picking Corn”, 2003. Mixed media, 130 x 60 cm. 38 Maria Madeira, interview with the author, Dili, Timor-Leste, 09/04/2013. 39 The artist in conversation with Filipa Queiroz, Macau, 10/06/2011. 40 Maria Madeira, interview with the author, Dili, Timor-Leste, 09/04/2013. 43Thus, Madeira believes that by utilising traces of Timorese traditions in her art work, she can promote the country’s culture in and outside the country. 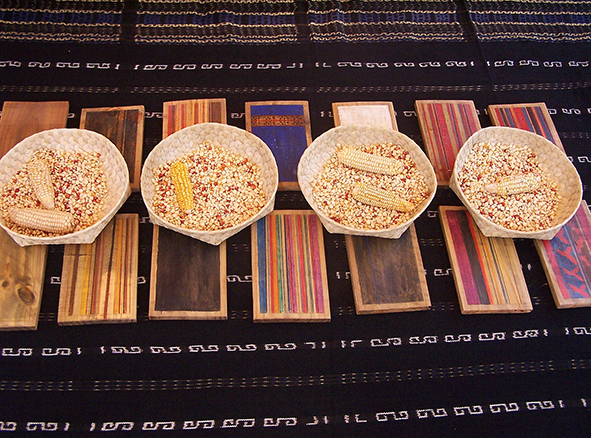 After researching deeply into her ancestral culture, she adapts and innovates with locally available materials. She does not foresee changing her work method, since it has allowed her to express grief in the past, and now permits her to show “who we really are and how we can revive, resurrect and celebrate our culture with pride and respect.”39 For her, “traditional culture is as important as the contemporary: the traditional culture speaks of who we are, whereas the contemporary culture speaks of how we perceive the world”.40 This is the reasoning of her approach. 45For Madeira, understanding our roots, however mixed they may be, is an interesting feature of culture that can be regarded as a source of knowledge. 46Maria Madeira does not act alone; the artist community also conducts an analysis of the political situation and expresses it in their art. What distinguishes Madeira is the agency that drives her activism: she believes that traditional culture can be utilised to educate the local population, and define our space of intervention in the global world. 47Thus Madeira continues her research related to her own identity. In the process, she reinvents the traditional crafts of the country. Her approach has expanded from the self towards the communal: in merging the traditional and the contemporary, she now finds ways to empower other Timorese, and especially women weavers. Her belief in the potential that resides in the contemporary is unusual, and we hope that Maria pursues her dreams and intentions: there are many other Timorese ‘voices’ to be heard, and Maria Madeira will proudly be their agent. 48Unfortunately Timorese artists, Maria Madeira included, cannot escape mentioning the political, economic, social and cultural anguish they have suffered. Herein resides the reasoning and importance of Movimentu Kultura, in which most of these practices can be included. If in its founding decade (1990) the application of ‘fragments’ constituted the form of fighting and resisting against an undesired occupant, the spirit is now one of reconstruction, celebration and pride. 49Timorese artists are, through Movimentu Kultura, defining the essence of contemporary Timor-Leste’s identity and culture. This is processed through the utilisation of traditions often imbued in the narration of current events, thus resulting in social comentary. Movimentu Kultura, as a tendency that conjoins the traditional and the contenporary has served the artists’ purposes; it has become a platform for forging a new and constructed identity, supported by local traditions, while providing them with new vigour. Barrkman, Joanna (ed.). 2008. From the Hands of Our Ancestors (exhibition catalogue). Darwin: Museum and Art Gallery Northern Territory in partnership with the National Directorate of Culture, Timor-Leste. —. 2013. Reaffirming the Kemak Culture of Marobo, then and now (exhibition catalogue). Dili: Timor Aid. —. 2014. Ina Lou (exhibition catalogue). Dili: self-published. Cinatti, Ruy. 1987. Motivos Artísticos Timorenses e sua Integração. Lisboa: Museu de Etnologia e Instituto de Investigação Científica Tropical. Madeira, Maria. 2011. List of Works 2003-2011. Dili: unpublished. “Protest in Paint”, The West Australian, Perth, June 25 1996. 1 Excerpt from interview with César, coordinator of Sanggar Dejukddil. Dili, 7/4/2013. Since I heard this definition, I have appropriated it for my own work. 2 Timor-Leste is the country’s name in Portuguese. My preference for the designation Timor-Leste (instead of East Timor) is based on advice from Prof. Michael Leach, a political scientist, who affirms: “Timor-Leste is probably best at this stage (the Timorese argue this better includes Oecusse, which is in west Timor)”. 3 Sanggar is the Indonesian word for studio. This usage probably results from the fact that most of the artistic community is formed by Indonesian-speaking Timorese from 18 to 30 years old. 4 Iliwatu Danabere is the Director of Arte Moris free art school; Ino Parada, one of the artists from the first generation of Arte Moris runs another organisation, Gembel Art Collective. 5 In 2011, I went to Timor-Leste for the first time. At the time I sensed a major interest by artists in the country’s culture. My interest in this topic – the utilisation of crafts in contemporary art practices – led me to include Timor-Leste as a case-study for my PhD. In 2013, I returned for further research. In these two field trips, I made contact with the local artists community and grasped the essence of their practices. 7 Maria Madeira explained to a journalist in 2011 that she was terrified to know that while Timorese women were abused by the Indonesian military in torture rooms, they were forced to kiss the walls, in “A lusofonia além da festa”, in Ponto Final, October 24th, 2011. 8 Ruy Cinatti conducted several studies about Timor-Leste between 1946 and 1966. His extensive writing spans areas such as anthropology, ethnology and archaeology of the Maubere people. 9 Tais is a woven textile, which is part of Timor-Leste’s classified intangible heritage. Found everywhere in the country, each locale has its own variations. It has been utilised in cultural ceremonies like weddings or funerals, but it has also served as a gift to visitors to the country. Historically, the tais depicted narratives told by the weavers, which gave origin to a variety of ornaments and colours. The method used in making tais is known as ikat in most of the world: this resist-dyeing technique is believed to have been invented in the Indonesian archipelago and spread through Asia and South America. 10 The senior artists are from a different generation than those who live in communities and consequently they are mostly Portuguese-speaking Timorese. The group includes artists such as Gabriela Carrascalão, João Bosco, Gelly Neves and Maria Madeira. All of the artists who were contacted in studios are around 30-years-old or younger, and thus are Indonesian-speaking Timorese. This group includes Iliwatu Danabere, Tony Amaral, Ino Parada, Casimiro, Abe, Alfeo, among others. 11 Susan Kendzulak mentioned Adrian Vickers, “What is Indonesian Contemporary Art? Inside Indonesia”, in http://artradarjournal.com/2013/08/02/what-is-indonesian-contemporary-art-inside-indonesia/, accessed March 11, t2014. 12 “… a proliferation of new small art studios such as [sanggar] Bekusi, Bulak, Weluru, Naroman, Jovil, Sukaer and Faloikai appeared”, Joana Barrkman, “A contemporary art movement in Timor-Leste”, in From the Hands of Our Ancestors [exhibition catalogue]. (Darwin: Museum and Art Gallery Northern Territory in partnership with the National Directorate of Culture, 2008). 15 Casimiro Valentim Pereira Zecaruno, known as Gil, interview with Leonor Veiga, Arte Moris Free Art School, Dili, 09/05/2011. For more on the artist, visit http://artemoris.org/artists/casimiro/, accessed in January 2014. 19 Casimiro Valentim Pereira Zecaruno, known as Gil, interview with Leonor Veiga, Arte Moris Free Art School, Dili, 09/05/2011. 20 Gabriela Carrascalão’s work, composed of large scale canvases, is extremely unique: aesthetically, her brushwork resembles watercolour; the compositions display groups of people, mostly women, dressed traditionally and with peaceful attitudes. Her work can be seen at http://www.youtube.com/watch?v=_VxlPFYD1VE, accessed in January 2014. 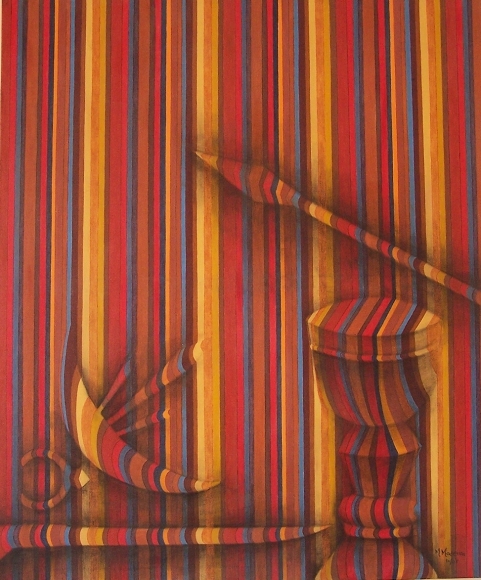 21 Alfeo is one of the oldest artists of Arte Moris. His work is very exceptional, since he usually works from his imagination: scenes are not coherent; the palette is vibrant; the themes are critical but avoid being frontal. His compositions can be found in http://artemoris.org/artists/alfeo/, accessed in January 2014. 22 Abe is also an Arte Moris artist, and is currently working there. His landscapes and portraits are imagined: he often represents skies and seas where he places a man, surpassing the limits of an aggressive nature. His work can be seen in http://artemoris.org/artists/abe/, accessed in January 2014. 23 Lafaek or Abo is the crocodile, which represents the grandparents or ancestors. In Timorese belief, the crocodile is the transformation of the ancestors’ body or spirit. 24 Francisco Xavier de Menezes, Encontro de Culturas em Timor-Leste. (Dili: Editora Crocodilo Azul, 2006), 201. 25 Uma Lulik, the sacred house of Timor-Leste, is very important for the population: in response to the population’s continuous veneration of these sacred sites, and their urge to rebuild them after their near-total destruction during the Indonesian occupation, the government has started the uma lulik classificatory process as intangible heritage in conjunction with UNESCO. In this respect, the best known house is one in the province of Lospalos, and which more artists have researched: the uma lulik from Lospalos is accepted as the ‘standard’ model, as other variations display a less intricate design. Thus, we are before another kind of ‘invented tradition’, in which the standard can ultimately lead to the erosion of difference and variations. 30 Maria Madeira maintains an international career as a visual artist, having represented the country in several exhibitions in Lisbon (1998) and Macau (2011). She has often been a keynote speaker in cultural events. Recently, she was the first East Timorese woman to have a solo exhibition in Indonesia. The show Ina Lou took place between 5 and 20 September 2014, at the Taman Ismail Marzuki, in Jakarta. 31 This activity is documented in the video, “Halo Pintura Ho Bua Malus / Painting with betel nut”. Dili: Arte Moris, 2009. Leonor Veiga, « Movimentu Kultura in Timor-Leste: Maria Madeira’s ‘agency’ », Cadernos de Arte e Antropologia, Vol. 4, No 1 | -1, 85-101.